Hey, guys!!! So I recently hit my 2 year blogiversary, yay!!!! So, naturally I wanted to do something wonderful for you the great supporters of my blog and what better way to celebrate than with an awesome giveaway to one of my favorite online brands. If you don't know ASOS is UK brand that sells regular and plus size clothing, shoes and accessories. So you're sure to find something you love if you win! 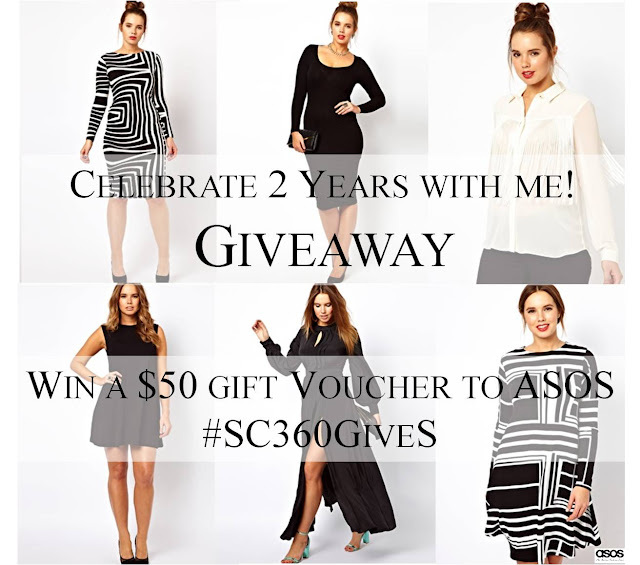 I'll be giving away a $50 gift voucher to ASOS to one lucky reader of Style Chic 360! The giveaway is open to all readers! 2). You MUST leave a comment letting me know at least ONE way you follow! 3). Enter via the RAFFLECOPTER below, you can sign in via facebook or use your email. Good LUCK everyone! Winner will be announced on Wednesday, March 29th! FTC: This giveaway is NOT sponsored.